Here we interview runners who have participated in the Uganda Marathon, so they can share their stories and experiences from the 7-Day Adventure. After all, it’s their involvement which makes the week so special, from the impact they have on the Charity Projects, to the community feel they give to Race Day. 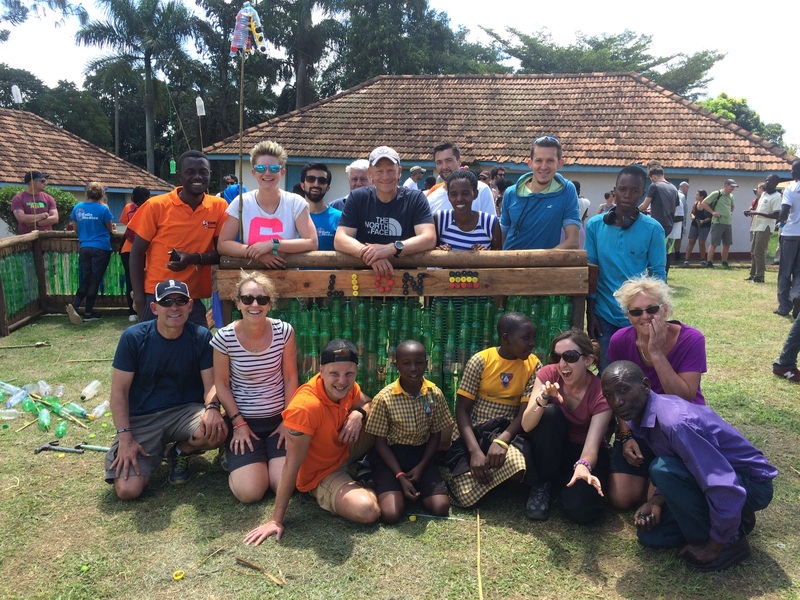 A team of seven joined us from King’s Ely School in Cambridgeshire, collectively fundraising a staggering £23,000 for the Masaka community! From the team Richard, Kathleen, Alison and (7-year-old) Eleanor, share their stories from the adventure. Below they discuss why they signed up, their fundraising experience, visiting the Charity Projects, and their different perspectives of race day, where some of them spectated and some of them ran the marathon! What made each of you sign up for the Uganda Marathon? Richard: Having never run a marathon I wanted my first to be unforgettable and for me, the chance to return to the land of my birth (over 56 years ago!) was one not to be overlooked. All I needed was one last push and that came from the acceptance of the Uganda Marathon as our school charity for the year and the encouragement of three further colleagues to form a team. We were also joined by my wife and a team member’s mother and daughter to swell our number to 7. The date was set and the challenge was on. Alison: Within 5 minutes of Richard, a colleague, mentioning that he was thinking of running a marathon in Uganda, I had been to the website and emailed him to say I was in! As a very keen runner, and a total Afro-phile (albeit limited to West Africa thus far), this was a challenge I could not refuse. I then realised that I needed to persuade my Mother to come along, in order to be able to take my 6-year-old daughter and join in the run. That didn’t take much persuading either! Kathleen: I signed up because I always wanted to go back to Africa, and not as a tourist – I wanted the full experience. When my daughter, Alison Stewart, said would I go so that I could be with Eleanor, it seemed the perfect opportunity. My husband didn’t want to come but I was desperate to come and be part of the team. Was it what each of you expected? 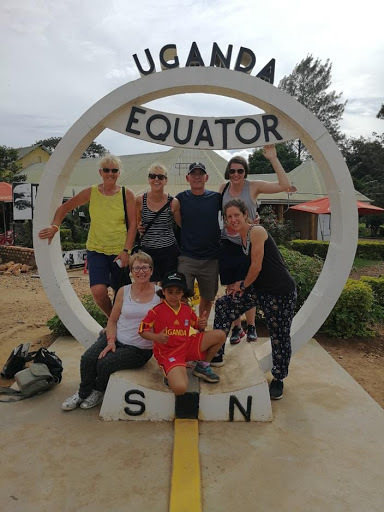 Richard: Having personally already experienced the vibrant environment of Uganda with its friendly and accommodating people, I had some idea of what to expect, but the actual experience was beyond my wildest dreams. It is one thing to be attracted by the challenge of a marathon but quite another to be able to actively become part of a dynamic community and volunteer to work on the sponsored projects. 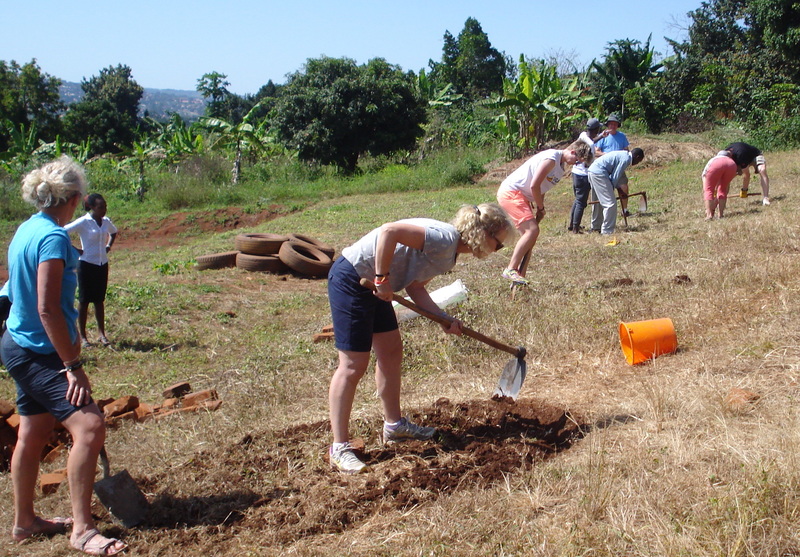 We constructed recycle bins, created vegetable gardens, built a pig pen and prepared a netball and volleyball court! 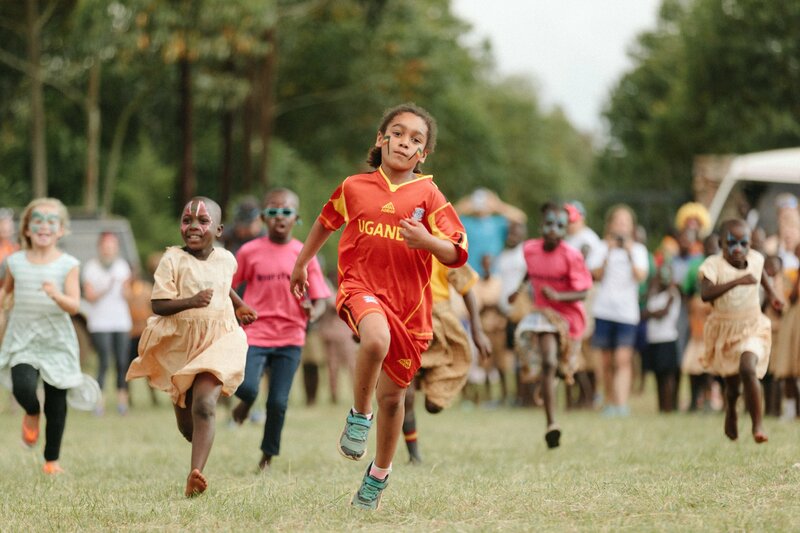 It quickly became abundantly clear that this was the real reason for us visiting Uganda and the “run” at the end of the week was a bonus to keep us excited! Kathleen: No! It was amazing, fantastic. 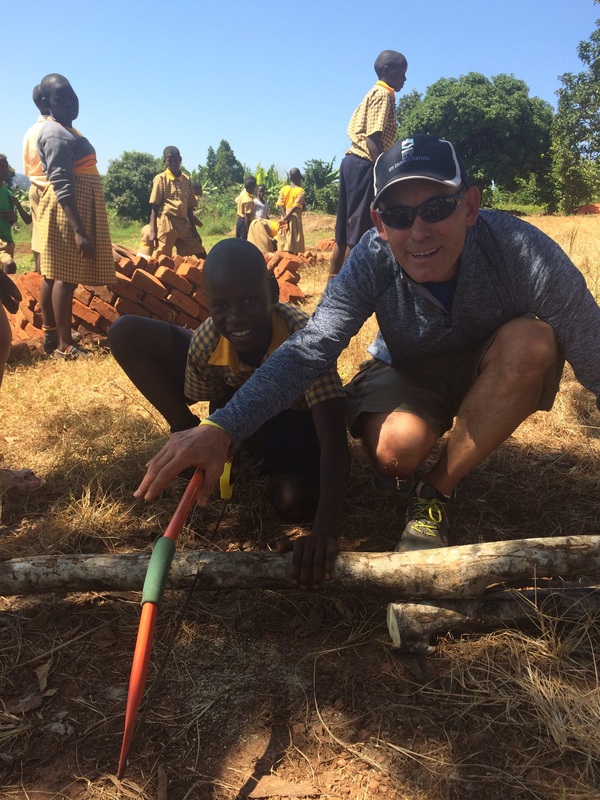 Who knew that we would be making gardens in Uganda, and visiting the school, I have to say that Eleanor was overawed with the crowds of children around her, but she managed it, and I did my bit in helping the team! Wheelbarrow pushing and loading was quite hard work! Alison: No! In so many ways! Although I really didn’t know what to expect. Uganda was very different from the West African countries I had visited – far more laid back, quieter, and a totally different landscape. The week was totally different from what I had expected. I certainly did not realise how much hard physical labour we would be doing – but it was all so worthwhile, and amazing what we achieved as a large group of fit individuals armed with tools! I also didn’t expect to be busy all day every day – it was exhausting! But it allowed us to see and do so much in such a short time. It felt like we spent way more than a week there. As for the run, I didn’t expect to be running through such remote locations – it was so beautiful. I also didn’t really expect to be on my own for so much of it or to have such awesome local support. Eleanor: It wasn’t as hard as I thought it would be, I could join in most of the work. I thought Uganda was just like Ghana because people carried things on their heads! Collectively you helped fundraise an amazing amount of money for the local community in Uganda. Could you tell us about your experiences of fundraising for the event? 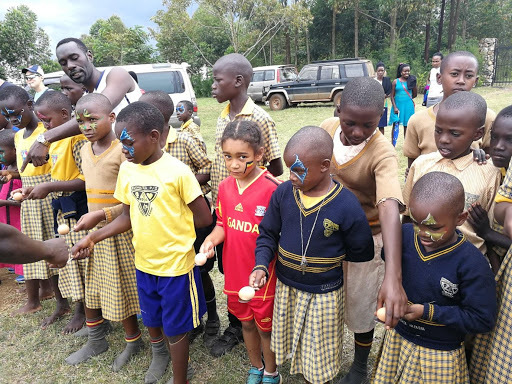 Richard: Fundraising, with the backing of 370 British school children, meant that we had a captive audience and it was a matter of keeping them informed and enthused. Starting with a break time cake sale we immediately launched our internal campaign. This was followed by a Christmas Fair and “Marathon training” with children running individual stalls and also being sponsored to complete physical fitness training with the team runners. 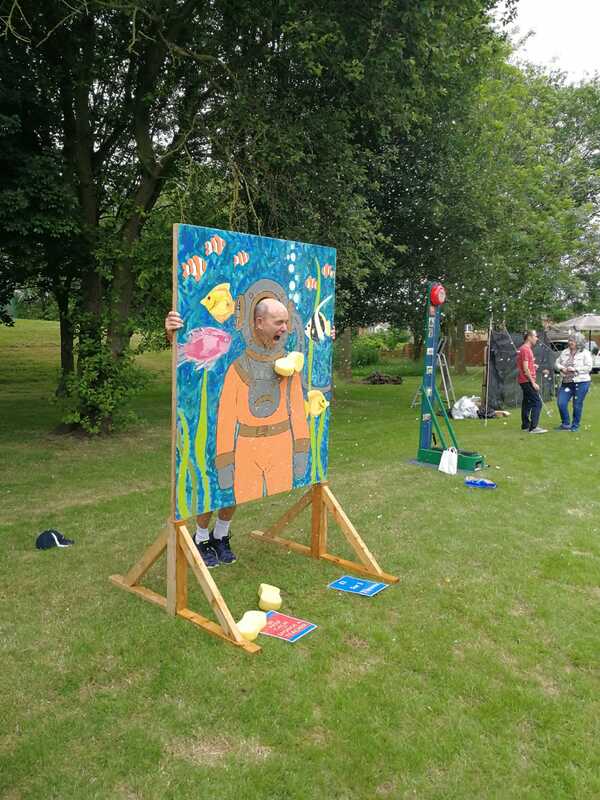 We continued through the year with further cake and ice cream sales (always popular), together with a small Easter Egg based Fair and culminating in a Soap Box Derby where home built box carts raced down a hill while activities and stalls encouraged everyone to spend money. We also quickly launched a BT My Donate site in order to encourage family and friends to contribute with the chance of recovering valuable gift aid. In such a way we have been able to raise nearly £23,000 and have smashed our record for year-long fundraising. Alison: I was very lucky to be part of a motivated team in a large school, which is where most of our fundraising took place. The kids and parents got right behind us which was awesome, and motivated us to keep coming up with new fundraising ideas. I particularly enjoyed getting everyone active by challenging them to complete a marathon in a month. Even the Principal joined in! I also have to mention here the matron of the boarding house I work in, who knitted hundreds of chicks and stuffed them with chocolate eggs, which raised loads of money at Easter. Kathleen: Fundraising was difficult as really don’t have the contacts, but I knitted and stuffed the chicks to be sold and made cakes and helped at a jumble sale, and supported wherever I could, so I felt involved. Eleanor: It was fun helping to raise the money – we made, sold and ate lots of cake! On Legacy Day, you visited either Ssunga Health Centre or Bugabira Primary School. Could you tell us about the experience? Richard: Since we are school-based, we partnered with Bugabira Primary School and quickly developed a link between our diversely different campus environments, including a competition to encourage children to exchange drawings under the title “From my window”. Arriving, early in the morning, we were quickly surrounded by the school children who sang and danced around us before leading us on a proud tour of their school. 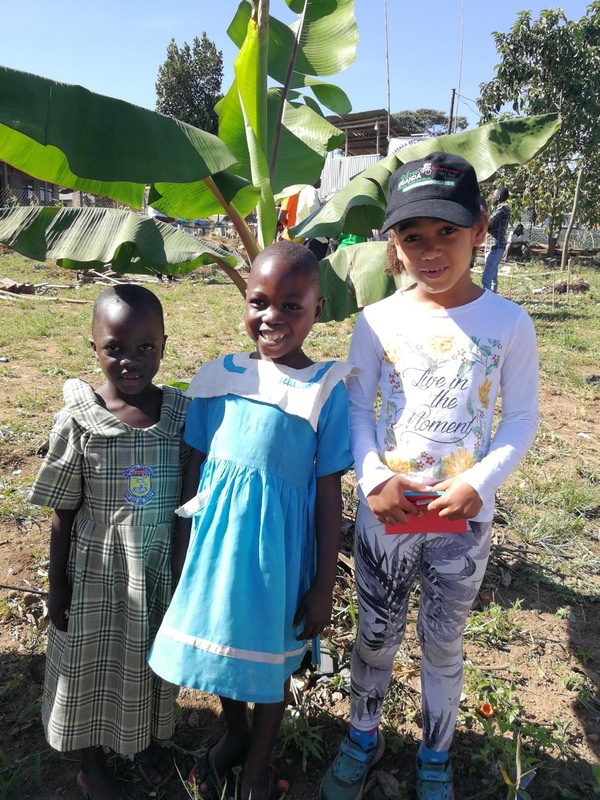 We were then put to work constructing 8 circular gardens for the children to grow their own food in and also endeavoured to prepare a flat piece of land for a netball and volleyball court. We enjoyed a hearty local lunch with the teachers and before leaving took part in a very competitive but friendly game of volleyball. As we boarded the bus for home it was satisfying to know that we had left a personal legacy that will continue to provide sustenance and entertainment for all the pupils into the future. Alison: The girls in my boarding house chose Ssunga Health Centre as our project, which I was delighted with as I thought it sounded like an interesting and very worthwhile cause. I thought we would be doing health-related activities, so I was a little surprised when we were asked to spend the day constructing a pig sty! I was reluctant and disappointed at first, but gradually realised that this was far more useful than anything else we could get involved in. It left a way for the nuns to raise an income and support their incredible work. It was so humbling to see how hard they work to look after the community with such basic facilities – and they all kept positive and smiling. It was hard to see pregnant mothers suffering from malaria, and shocking to see the birthing suite, but it just made me realise how privileged we are, and how we really shouldn’t moan about our healthcare system. Eleanor: It was crazy but fun visiting Bugabira school with Granny. I was surprised how big it was. It was difficult because I couldn’t understand their language, and scary when all the children gathered around me, but in the end, I had fun playing with them as we enjoyed the same things. 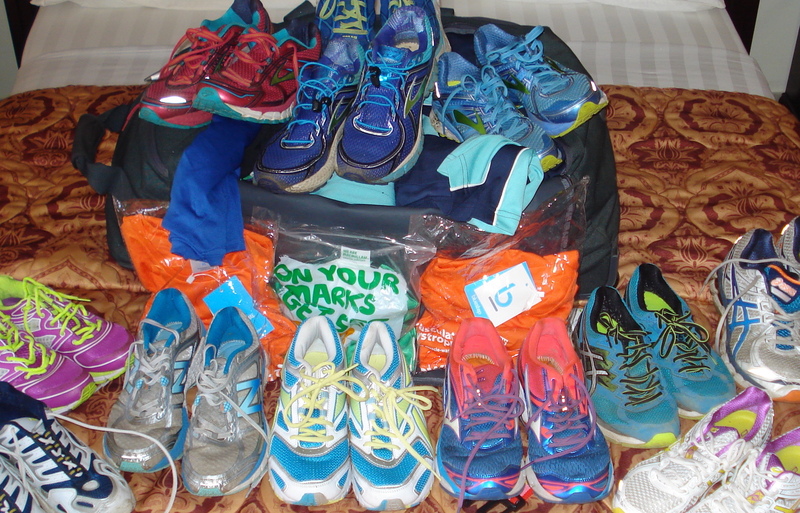 What were your experiences of Race Day, from spectating to taking on the full marathon? Richard (42K): As race day drew closer, the atmosphere grew tenser and the appreciation of what we had committed to became all too clear. Fortunately, the day dawned cooler and overcast with a slight early morning mist, and at 7.25am we launched ourselves to the task ahead. 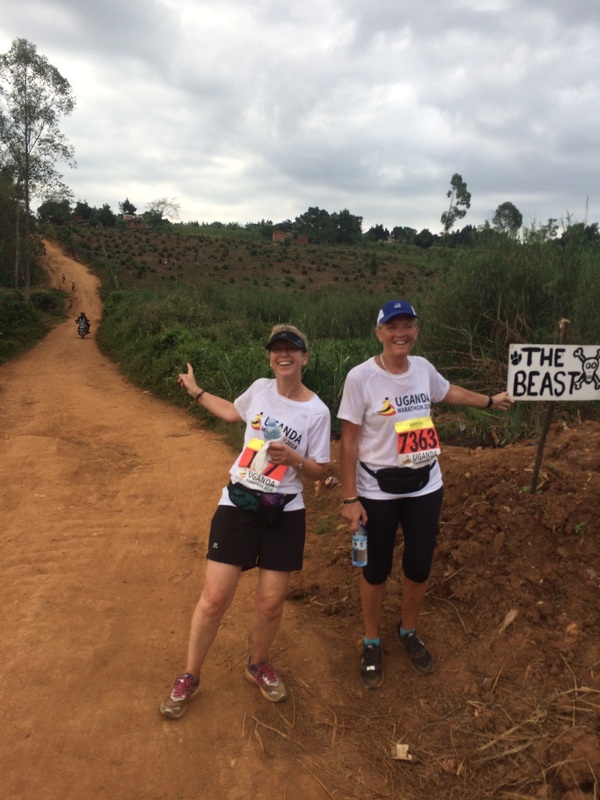 Driven on by the immense encouragement of the local Ugandans who lined the roads (mainly hard, dusty red soil know as murrum) and with friendly shouts of “mzungu” (white person) from the children who would run along beside us, we made good progression. We all completed the half marathon in good time and I continued on for a second lap. All was going well until I hit the wall at 38km and it became a struggle to continue to run, however, I had to carry on knowing I had a host of support behind me. Slowly the distance shortened and, although the ending was not quick, I was able to successfully complete it at a reasonable pace. It is inevitable that the question on everybody’s mind is how quick and what position we came, but this event was so much more than that. To complete is a massive achievement in its own right, especially as one seasoned runner, who had completed a marathon on every continent, rated this in his top 5 hardest. But if you really want to know our half marathon runners completed in a very respectable 2hrs 40mins and I set a PB at 4hrs 45mins. No positions have been given but, since about 120 international runners took part, I am proud to be counted within that number as a “finisher”! Kathleen (Spectated): It was an experience. We were anxious as knew Ali was going to struggle, but I was excited to see everyone come back safely. It was a long day, but Eleanor and me played games and spoke to lots of people, it was so lovely and friendly. 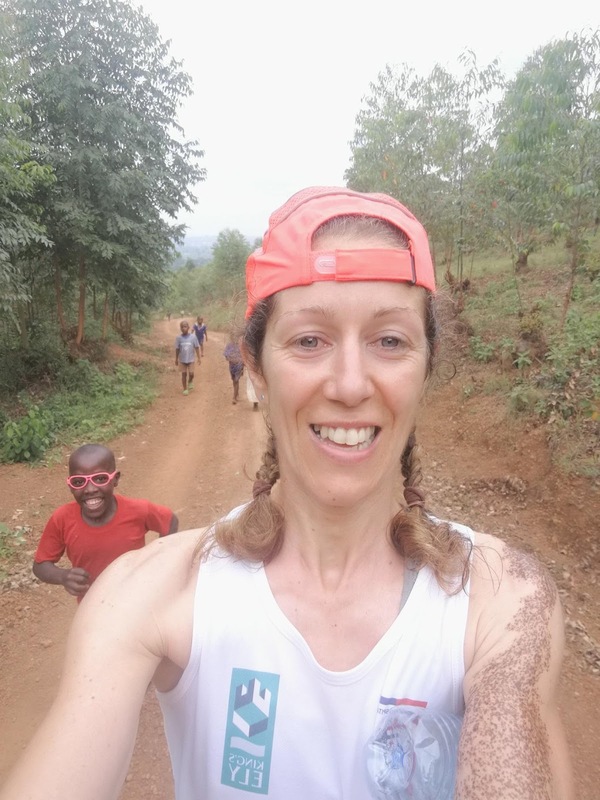 Alison (42K): Being an experienced runner, I signed up for the 42km, but an injury in a marathon 7 weeks previous meant I approached the race with trepidation. 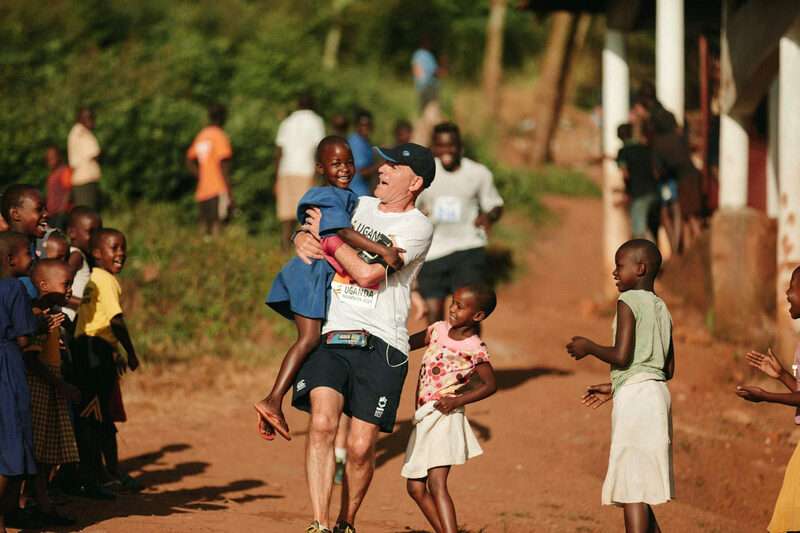 I was gutted not to be able to run it properly, but once I arrived in Uganda, I realised that the week was really not about the run, it was just an added bonus at the end! This totally took the pressure off, and it was great to see the ‘athletes’ drinking beer, eating whatever was presented to them for dinner, and disregarding any training plans in the week leading up to the run. I managed to add 2.5 hours to my previous marathon time- but learnt so much. By being forced to slow down, I saw so much more. I chatted with the kids who jogged and cycled alongside, I interacted with the friendly locals in the villages, and I had time to take on water and bananas along the way. At the end of the first lap, I probably should have stopped, but the second lap was magical, albeit excruciatingly painful. I was all alone on quiet footpaths through the spectacular scenery one minute, and being sang to by the incredible marshals the next. Such an amazing experience. Seeing my little girl waiting for me with a big smile on her face at the finish line was the most emotional point of all. Eleanor (Spectated): It was a long and tiring day watching all the runners and cheering for them, but very exciting too. I wanted to run as well. The girls prepare for the hill known as ‘The Beast’! Finally, for each of you, what was your favourite memory from the Adventure? Richard: Without a doubt this was “An adventure like no other” and the undoubted stars of the show were the Uganda people themselves. From the children being supported to the adults who care for them, we received a hugely friendly welcome and the thanks and appreciation for us visiting was obvious. It is incredibly humbling to visit an area where poverty is endemic but the people are so determined to make the most of what they have and to take advantage of the help provided through the Uganda Marathon. Kathleen: Favourite part? So hard to say. All the runners were so friendly and so keen to share experiences with me that I felt part of it, even though I was a non-runner. The gardens we dug, the people we met in the community, particularly at the recycling centre, and how the guys with disabilities are so amazing. I bought a super bag from them which I love. 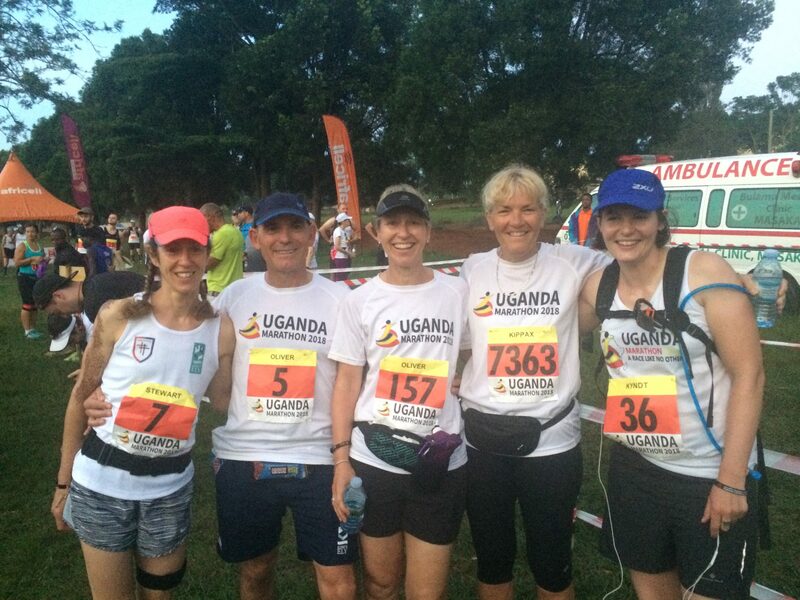 And [the Uganda Marathon team] made it all happen, it was the most amazing trip. I am so pleased that I have had such a brilliant experience, and was so lucky to be part of the King’s Ely team, and part of the whole Uganda experience. I will never forget it. Alison: There are so many! I loved the sports day – seeing the joy on the school children’s faces, and watching my little girl get involved alongside them. I also loved seeing her spend her time playing with local children she had met- no shared language, but lots of shared joy! However, nearly all of the 330 minutes I spent out on the marathon course will stay with me for a very long time! Eleanor: I loved cheering for people on the finish line. I also liked joining in on the sports day. A big thank you to King’s Ely School for their impressive fundraising efforts, their support over the year, and sharing their stories and photos of the 7-Day Adventure with us!